hunt for the four types of edible truffles that grow there. At NW Truffle Dogs in Oregon City, Oregon, dogs are trained to hunt truffles and their owners are trained to recognize the behavior that says the dogs have found them. It's a natural since dogs just love to rummage through underbrush for a good sniff. Since the truffles are food, the owners need to be on the job so that the truffles are gathered before the dogs eat them. So far the school has graduated a total of 46 dogs and owners. Tuber gibbosum, the Oregon spring white; and Kalapuya brunnea, the somewhat rare Oregon brown truffle. Black Truffles (Public Domain Image)The dogs are part of a pioneering effort to improve the reputation of Oregon truffles in the truffle market. Harvesting truffles, even with canine help is very labor intensive, and the Oregon truffle costs around $400 a pound. 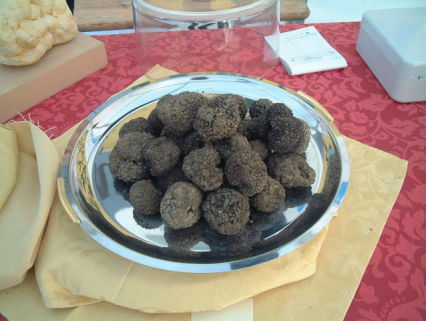 However, truffles from the more traditional forests of France and Italy can command $4,000 to $6,000 a pound. 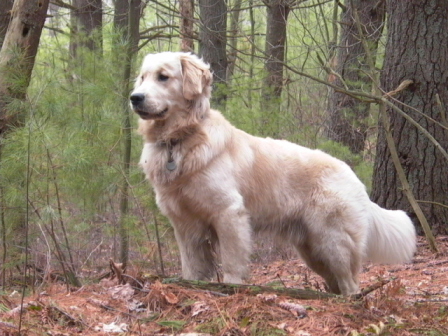 NW Truffle Dogs was founded by Elizabeth Kalik, a former trainer of search and rescue dogs. She read an article in Bark magazine about the need for truffle dogs and became intrigued by the possibility for a new business for her training skills. She started by training her own dogs, a Newfoundland and two Beaucerons, to zero in on the scent of truffles with the help of Oregon truffle expert Charles Lefevre. From there, Kalik and a former search-and-rescue colleague, Kelly Slocum, founded NW Truffle Dogs in 2010. Before a dog is accepted into training they are assessed for their suitability to be a truffle dog. These qualities include overall fitness, the ability to stay focused, ability to think independently, and a tolerance for snuffling around in areas that can be cold and damp at times. Any breed of dog can be trained, but some breeds like Labrador and Golden Retrievers tend to be especially well suited to the task. The Awesomeness of Service Dogs -- The Animal Video Of The Day!! !